High-index lenses offer reduced weight and better vision for people with strong prescriptions. Designed for those requiring strong prescriptions to correct nearsightedness, farsightedness, or astigmatism, high-index lenses are light and thin. Though more costly than plastic lenses, they are often more comfortable for those with very strong prescriptions. The thinner, lighter lenses maintain the same level of optical quality, and an eye doctor may suggest them or a patient may request them. High-index lenses can also be beneficial in today's fashionable rimless or thin-rimmed styles. The design of these frames causes the edges of the lens to be highly visible, and this can detract from their appearance when lenses are too thick, particularly for those treating nearsightedness, who require lenses that are thicker at the edges than they are in the center. Clear vision is the result of light refracting on the retina in a precise location. The size of the eye and the lens' and cornea's curvature are responsible for doing so correctly in order to experience perfect vision. Blurred vision results when light is refracted improperly. The most common refraction errors are nearsightedness, farsightedness, and astigmatism, and these conditions can be remedied with surgery, eyeglasses, or contact lenses. Higher-index lenses refract light to a greater degree than do lower-index lenses. Because of this, high-index lenses require less material to achieve the same refraction. High-index lenses are classified on a scale of 1.53 to 1.80 as to how strongly they can bend light, while conventional plastic lenses have a refraction index of 1.50 and glass lenses, 1.52. Lenses with indexes of 1.70 or higher will be at least 50 percent thinner than typical plastic lenses. Due to their varying indexes, high-index lenses can be 20 to 65 percent thinner than traditional lenses. Lens power is measured in diopters. 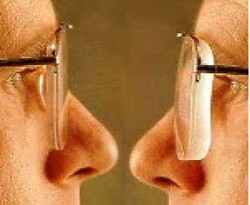 Nearsighted patients will require lenses with negative diopters, and farsighted patients will need positive diopters. When prescriptions must be stronger than +2.00 or -2.50, high-index lenses begin to show their benefits in lighter, thinner lens requirements. For weaker prescriptions, the difference is not noticeable. Because high-index lenses work more efficiently, they will have thinner edges and use less material than standard lenses. The decrease in material used leads to improved comfort for the wearer simply because they will be lighter. High-index glass lenses, as opposed to plastic, will be heavier than traditional glass, despite retaining a thinner appearance. Do You Have High-Index Lenses In Your Glasses? Lightweight high-index lenses are particularly beneficial for those who are severely farsighted and require strong prescriptions. Traditionally, these lenses are quite heavy and uncomfortable. In addition, the design of these standard lenses, thin at the edges and significantly thicker in the center, can create a bug-eyed appearance on the wearer. High-index lenses are designed aspherically and create a slimmer profile for a more attractive look. This is beneficial not only to the wearer but to others as well, who may be more able to focus on the individual himself rather than his strange appearance due to his glasses. Polycarbonate lenses offer similar aesthetic benefits and are often mentioned as an alternative. However, they scratch much more readily and are difficult to coat or tint. Polycarbonate is also more likely to create vision or color distortions. High-index lens styles offer many benefits, but those benefits do not come without a significant cost. As lenses increase in their refractive index, their price will typically rise as well. The best material for any particular pair of glasses from the wide array of high-index materials available will be determined by the prescription itself. The stronger the prescription, the higher index lens will be called for, ultimately resulting in more expensive lenses for stronger prescriptions. When asking about high-index lenses, patients should take into account the eye care professional's judgement and advice in order to ensure the best possible lens is selected.